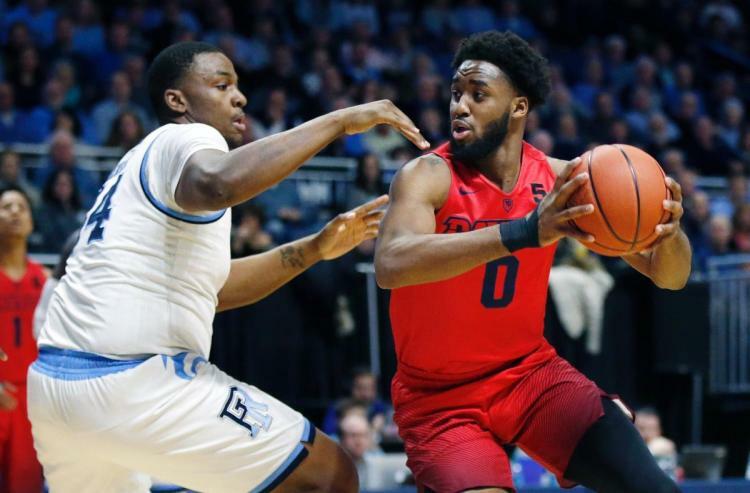 A fifth-year senior from Chicago, Illinois, Josh Cunningham might be the most efficient player in the A-10 this season. Shooting an incredible 65% from the field last year, Cunningham became Dayton’s go-to-guy game in and game out. Averaging 15.6 points and 8.4 rebounds per game in 2017-18, the 6’7″ big man seems primed for a monster senior season. It would not come as a surprise to see Cunningham continue his highly efficient production from last year. If he does just that, Cunningham will be a frontrunner to win A-10 Player of the Year as the captain of what should be a much improved Flyer squad. Steph Curry 2.0? Ever since Kellan Grady stepped foot on Davidson’s campus, the 6’5″ point guard has been drawing comparisons to Curry. Realistically, however, leading the Wildcats to an Elite 8 and going on to win two NBA regular season MVP awards is an absurd amount to live up to. That said, Grady showed flashes of potential Curry-level greatness in his freshman season at Davidson. Averaging 18 points per game and shooting 37% from three, Grady has some undeniable offensive firepower. If Grady wants to win A-10 Player of the Year this season, though, he will need to do two things: play lockdown defense and increase his assists per game. The points will certainly come, it’s the defense and assists that could make or break Grady’s 2018-19 POY case. One of the Atlantic 10’s most improved players last season, Luwane Pipkins is looking to up his game even further this year. A 5’11” junior point guard, Pipkins became the Minutemen’s most dynamic offensive player in 2017-18. Averaging 21.2 points and four rebounds per game as a sophomore, Pipkins doubled his production in nearly every category. In addition, Pipkins shot a remarkable 43% from three last season. Establishing himself as the clear leader of the Minutemen, expect the junior guard to have another huge year. If Pipkins continues from where he left off last season, he will have a serious chance to win A-10 Player of the Year. A graduate senior originally from St. Louis, Missouri, Courtney Stockard made quite the initial impression in his first season as a Bonnie. Averaging 13.3 points and 6.3 rebounds per game, Stockard became part of a three-headed monster playing alongside Jaylen Adams and Matt Mobley. In St. Bonaventure’s first round 2018 NCAA tournament game, Stockard absolutely went off. Scoring 26 points to go along with four rebounds and four steals, Stockard led the Bonnies to a 65-58 tournament win over UCLA. With Adams and Mobley both gone, St. Bonaventure will rely heavily on Stockard this year. If the 6’6″ senior forward can pick up where he left off, he could give himself a chance to take home A-10 POY. Making steady improvements throughout his career, Otis Livingston II has set himself up to have a big final year at George Mason. A 5’11” senior guard from Linden, New Jersey, Livingston has improved his game step by step, season by season. As a junior, Livingston averaged 17.3 points, 4.4 assists, and 3.2 rebounds per game. While Livingston might not have flashy talent like Grady and Pipkins, he has become one of the most dependable point guards in the conference. As the senior leader of the Patriots, it would not be surprising to see Livingston in the running to win 2018-19 A-10 Player of the Year honors. It will be Jordan Goodwin. Don’t sleep on Charlie Brown. With all due respect to the other guys Charlie had 10 NBA scouts in last preseason before he was lost for the year and the pros are back in the house at Hagan again this year.